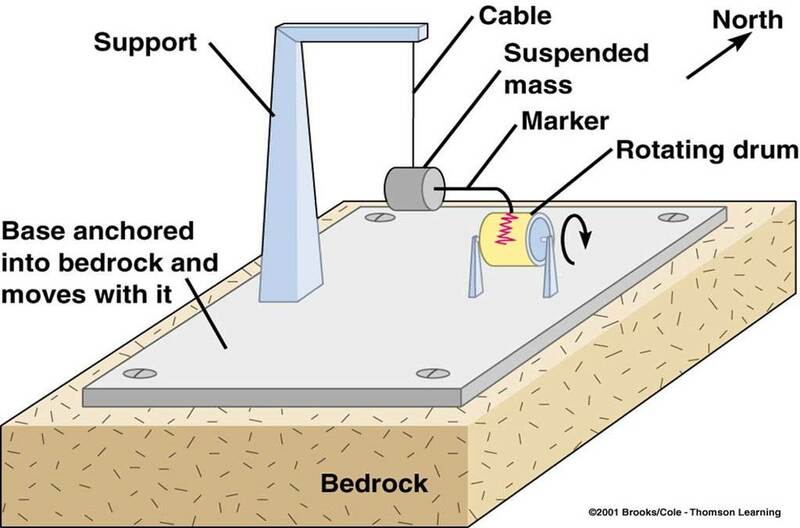 The power (magnitude) of an earthquake is measured on the Richter scale, using an instrument called a seismometer.The Richter scale is numbered 0-10 with 10 being the most powerful. The Richter scale is logarithmic – an earthquake measuring 7 is 10 times more powerful than one measuring 6 and 100 times more powerful than one measuring 5. 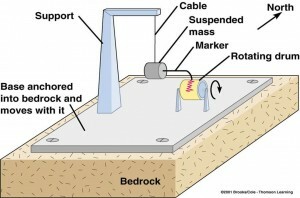 Up until 2 on the Richter Scale only instruments will detect the earthquake. 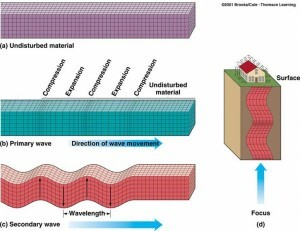 Earthquakes above 6 cause serious damage and sometimes many deaths. 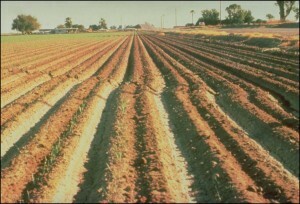 Caption: Earthquake of October 15, 1979, Imperial Valley, California. Epicenter: 32.6 deg N; 115.3 deg W. Magnitude 6.8. Damage: $30 million. The earthquake was felt over approximately 128,000 km2. The worst damage occurred in southern Imperial County and northeastern Baja California where eleven businesses and two homes were destroyed. 440 businesses and 1565 homes were damaged. Although there were no deaths, 91 people were reported injured, mainly by flying glass or by falling objects.A fault trace crosses a cultivated field near El Centro. 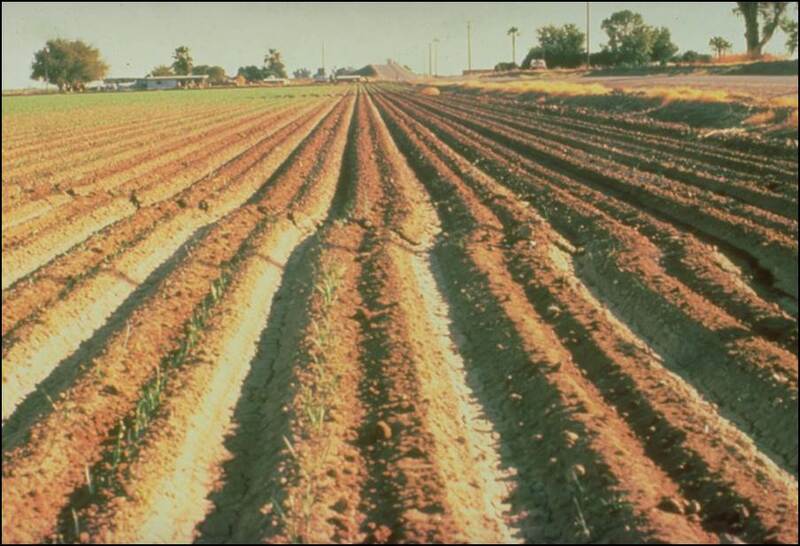 The surface rupture on the Imperial Fault extended from about 2.5 miles (4 km) north of the International Border to about 2.5 miles south of Brawley. Maximum lateral displacement was about 22 inches (55 cm) in Heer Dunes and the maximum vertical displacement was 7.5 inches (19 cm) southeast of Brawley. Caption: Earthquake of March 28, 1964, Prince William Sound, Alaska, USA. Location: Prince William Sound, southern Alaska. Affected area: 500,000 square miles. Damage: $350-500 million. The earthquake was one of the most violent ever recorded. 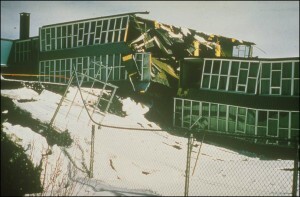 In addition to the Government Hill School which was destroyed, the Denali School incurred considerable structural damage. The entire second floor of West High School classroom wing was a total loss. Chugiak and Eagle River elementary schools incurred some damage. Despite widespread destruction, ten of Anchorage’s 20 schools reopened on April 6, ten days after the earthquake. Government Hill Elementary School split in two and was virtually destroyed when the ground beneath it slumped down. Fortunately, the earthquake occurred on Good Friday, a school holiday. 1.1 What is the Elastic Rebound Theory? 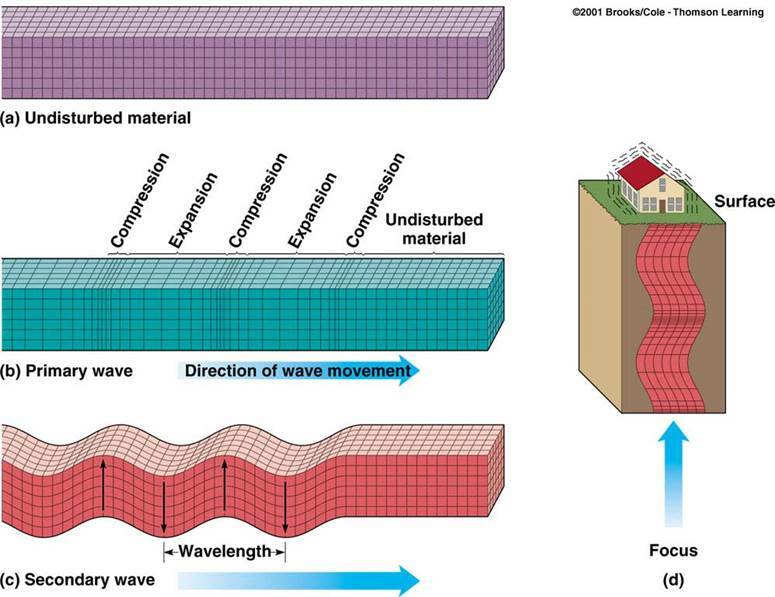 1.2 What are Seismic Waves?